The original Ragdoll Cat Breeder was Anne Barker who created the breed in the 1960's and they were brought worldwide attention by Denny and Laura Dayton. Anne bred Ragdolls from predominately Persian and Burmese breeds that had desirable traits such as a large size, a placid demeanor and a fondness of being around humans. Although they are large compared to other breeds (males are between 12-20lbs and females are between 10-15lb, on average), they are very gentle beings and are generally happy to be picked up by people. They have a muscular body with short legs, however because they are docile, they should not be left outside for prolonged periods - or at all - as they will not defend themselves if attacked. For this reason, Ragdoll Cat breeders will tell you it is very much an "indoor" cat. 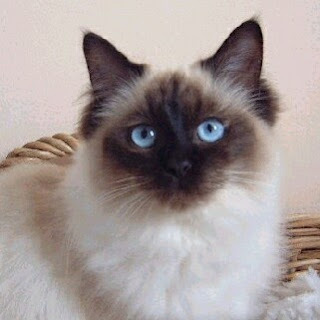 Ragdoll's have large blue eyes and rounded ears that tilt forward slightly. Color point - Dark colored feet, ears, tail and face with a lighter body color and no white markings. Mitted - Similar to a color point but with white paws, chin, stomach and ruff. Bi-color - Dark points on the ears and tail and light between the eyes. Dark points also on the back with a pink nose and paw pads. Although it has a soft medium-long coat, a Ragdoll Cat will not require to be groomed constantly and it's fur will not matt or shed to excess. As previously mentioned, Ragdoll Cats are sociable creatures so you must be able to give them attention and not leave them alone for long periods. They are also quiet and not particularly active. They make a loving companion that is easy to train and will got along with other cats. I hope you now understand a little more about Ragdoll Cats and if you decide that the Ragdoll is right for you, you will discover it can be a highly rewarding experience.